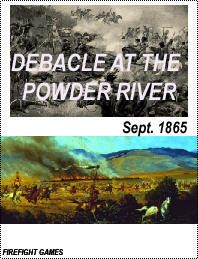 The Powder River campaign of 1865 had only one purpose: to search and then destroy Indians, wherever found. There were three columns of troops descending from different forts upon the Tongue and Powder Rivers in Wyoming and Montana. In charge of it all was Brig. Gener-al Connor, whose column of left Ft. Laramie and arrived at the Tongue to build a new military fort, Fort Connor, starting in mid-August. Two other columns, one under Col. Cole with 1400 men left Omaha on July 1, and another under Col. Walker, of 600 men, left Ft. Laramie. These two columns failed to find Connor’s troops but were able to meet each other near the Black Hills and then moved through the Badlands to the Powder reaching it at the start of September. These two columns were huge affairs comprising of 1200 horses,185 wagons and crossing areas with no roads.